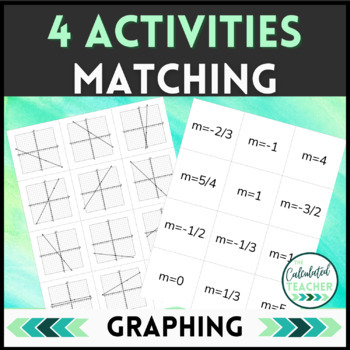 This bundle will give your students plenty of practice with determining slope from a line and making lines on a graph based off of slope and y-intercepts. 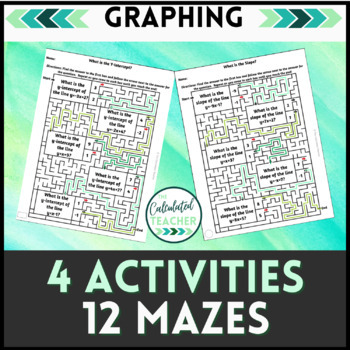 A mix of hands on and no prep worksheets, this bundle will fit your needs to teach slope! • Please go to your My Purchases page (you may need to login). Beside each purchase you'll see a Provide Feedback button. Simply click it and you will be taken to a page where you can give a quick rating and leave a short comment for the product. Each time you give feedback, TPT gives you credits that you use to lower the cost of your future purchases. I value your feedback greatly as it helps me determine which products are most valuable for your classroom so I can create more for you. • Look for the ★ next to my store logo and click it to become a follower and receive updates. Check out my blog for resources and teaching ideas. Please reach out in the Q and As if you have a question or concern with this product.